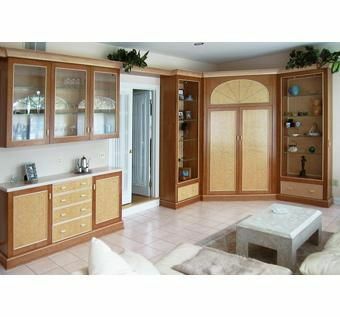 A series of cabinets for a large "Florida" room. One case houses a projection TV(built in 2000) and AV components. The display shelves on each side are 1/2" glass. The sunburst pattern above the retracting doors mirror the arched windows opposite. 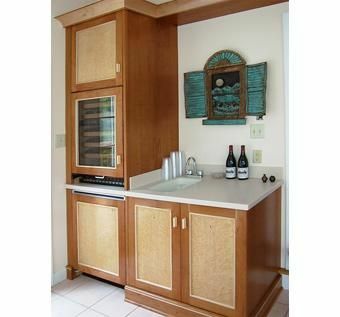 A serving cabinet with display shelves in centered in the room, and a bar cabinet at the other end houses a Sub-Zero refrigerator and wine cooler. 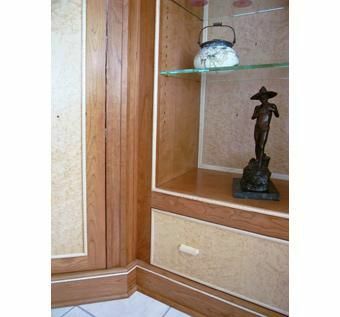 Made of cherry with birds eye maple veneered panels, and curly maple banding and accents.